This is a gold finished 6 inch hatpin hat pin. The adornment is 2.25 inches. 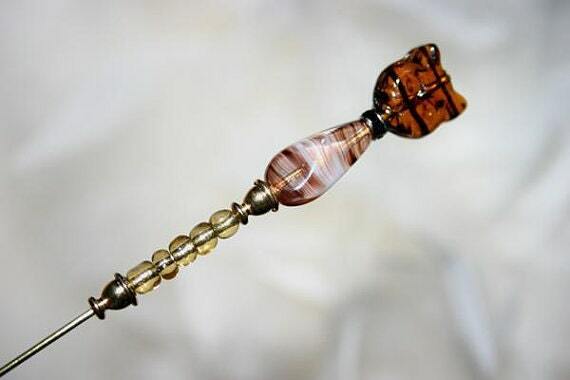 The top bead is a 13mm cat face made of tortoise design glass, followed by a rhinestone rondelle. The body of the cat is white pinched watercolor glass drops. The tail is tiny gold glass beads. All metal is gold finished, but NOT actually gold. My hat pins always come with a tip protector!